A recent publication by the non-profit organization Americans for the Arts entitled “Arts Education Navigator” documents two truths about arts in education. The first truth detailed in the publication is about the great benefits that students receive if they have a high level of involvement in the Arts as part of their education. Students with an education rich in arts are “4 times more likely to be recognized for academic activity”. These students are “4 times more likely to participate in a math and science fair”. They are “3 times more likely to win an award for school attendance”. The publication also demonstrates that Arts Education leads to lowered drop-out rates and a greater likelihood of college graduation. These statistics were collected from several studies conducted for such groups as the National Endowment for the Arts, The President’s Committee on the Arts and the Humanities, and the Arts Education Partnership. The second truth concerns the unfortunate decline of the availability and utilization of art in education in the US. Surveys cited in the document indicate that teachers are devoting less time to music and the visual arts. In addition, access to arts in education has fallen over time for underserved populations such as African Americans and Hispanics. 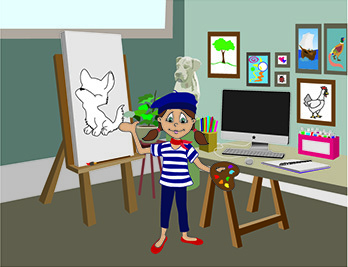 Considering the state of the arts in education, FasTracKids is looking to help. Our newest camp, titled Artist Studio, teaches about several visual art styles and five classic artists. Students will enjoy getting hands on involvement with painting, sculpting, mosaics and more. In addition, there are many new, exciting games for the interactive whiteboard. Take a look at the new Artist Studio camp, and help us encourage arts in education!